Al-Ahram's Advertising Agency struck a sponsorship deal with Egypt's Weightlifting Federation to promote the federation's activities and athletes. 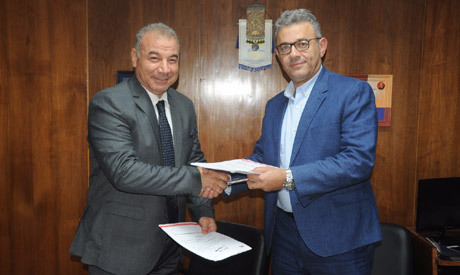 The deal, which will last until 2020, also gives Al-Ahram's agency the exclusive rights to organise the weightlifting federation's tournaments, promote its brand and bring sponsors to Egyptian weightlifters. "This deal marks one of the great achievements of the weightlifting federation because it's with the biggest advertising agency not only in Egypt but also in the Middle East," the federation's president Mahmoud Mahgoub said in a statement. "The deal will have a positive impact on Egyptian weightlifting. It will encourage more sponsors to move towards weightlifting and will allow us to fully prepare our athletes to win more titles." Mahgoub also said part of the revenue the federation will get from the deal will go to Egypt's weightlifting stars Mohamed Ihab and Sara Samir, winners of two bronze medals at the 2016 Olympic Games in Rio de Janeiro. Hisham Lotfy, the head of Al-Ahram's Advertising agency, hailed the sponsorship deal, saying Al-Ahram always has a role to support the country's promising athletes. "This is the latest in a series of sponsorship deals in Egyptian sports that Al-Ahram has started with Taekwondo star Seif Eissa … it also shows that Al-Ahram is a pioneer in sponsoring the not-so-popular sports which achieve great results," he said.